Scooter Skills’ has been developed for schools to train pupils how to scoot safely. By training pupils to scoot properly it will encourage them to scoot to school, be fit and healthy, and in turn help to reduce the amount of car use on the school journey. 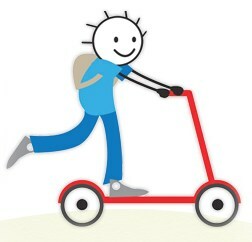 There are two Scooter Skills packs to choose from depending on how the school would like to run the training. Both courses could be run during school time or as an after school activity. ‘Brief Scooter Skills’ is a single one hour session which involves pupils rotating around different workshops, ending in a fun games session. ‘Scooter Skills Levels’ involves three individual sessions. These documents are available to download, there are also certificates available to print off and present to pupils. Schools could consider developing a ‘scooter policy’ or getting pupils to sign a ‘scooter code of conduct’ to help get pupils and parents to agree to scoot safely and considerately.